The next stop on our magical mystery tour at CES brought us over to MSI. Outside of the aforementioned items in the title, they showed off a couple of new laptops equipped with Kaby Lake, some VR ready desktops, and even an external enclosure for GPUs they named G.U.S (stands for Graphics Upgrade System). 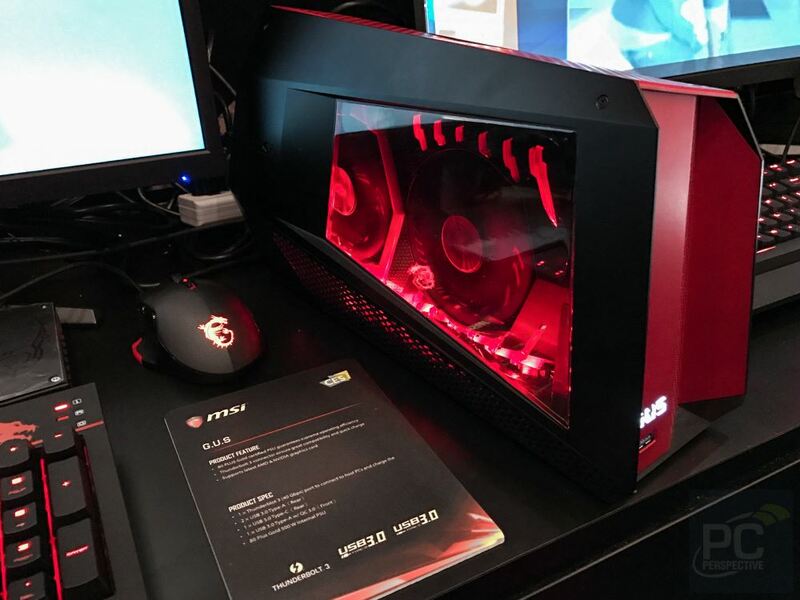 MSI’s G.U.S includes a 500W power supply and is connected via Thunderbolt 3 (40 Gbps). This niche unit offers a video card upgrade path for those with a laptop or mini-PC. On the back of the unit you can find, two USB Type-A and one Type-C. On the front is another 3.0 Type-A port that also functions as a quick charger. MSI did not have information on release or cost at this time. Of course, our focus was on the new motherboards for Kaby Lake and the upcoming AMD Ryzen based CPUs. On the Intel side, they had many of their boards on display. From the Xpower Gaming Titanium we used for our review of Kaby Lake, the Krait Gaming series, and B/H series boards, to an ITX model in the Gaming Pro Carbon AC. On the AMD side, a total of two boards (X370 based) for now. I am sure that lineup will fill out as we get closer to the Ryzen release. Many boards in the lineup have RGB Lighting using their Mystic Light software to personalize the look. MSI will has over 30 models in four segments. With the release of Z270, they have added features such as the M.2 shield on some models to help remove heat from the hot running PCIe 4x M.2 SSDs. With VR looking to continue gaining traction on the scene, MSI has VR Boost which is supposed to deliver a better VR experience with lower latency and less chance of getting motion sickness. The Enthusiast Gaming line adds Audio Boost 4 Pro, with Nahimic 2, based on the new ALC1200 CODEC which on paper seems to have a bit better SNR and other improvements. On board sound keeps improving as the generations move on. Along with the new audio, the Gaming M7 motherboard uses the Mystic light LED mentioned earlier. The new Z270 Gaming pro Carbon in the Performance segment also has added the RGB Mystic Light. From the Arsenal lineup, the affordable and themed Z270 Tomahawk board is made for great performance during long gaming sessions sporting the use of the Gaming LAN and Audio Boost. Below are just some of the 30 boards MSI will have to offer consumers. You can find more information on all of what was seen at the MSI website. Please keep a lookout on the front page for reviews on some of these items and more CES 2017 coverage!